Scary School is written from the point of view of Derek the Ghost, a previous student of Scary School until he died in a lab experiment gone wrong. 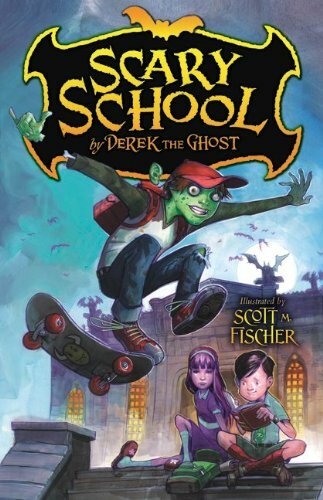 Derek feels that it is his mission to tell the story of Scary School for the rest of the public and he tells all the adventures that occur within a school that admits both human children, vampires, werewolves, zombies, half possum, and other monsters. Scary School is also a place where the teachers are monsters and if a child misbehaves or doesn’t excel he/she/it may be eaten or suffer some sort of punishment that is not as extreme as death. Derek explains all the teachers quirks and how the work their classrooms while explaining what the students themselves do within the school. This book really set up the background for more books to come, but also had a funny plot interwoven with all the introductions. Scary School was chosen to host the Ghoul Games (sort of like the Olympics, but for children in the monster community) and the Headmaster at Scary School is informed that if the human children lose to the monsters they will be eaten (the man in charge of the games does not like the idea of humans and monsters mixing in schools). As Derek describes the students and teachers he highlights their attributes so when the Games come around, the reader already has some sort of idea of what kind of strategy each character has for the Games. This was such a good book for middle school grades, and even though I’m in high school, I still enjoyed it immensely. Even though there may not be as in depth character or plot development as in YA books, this is expected because it is, in fact, a middle grade book. However, I was still able to connect with the characters and root them on as they performed not only in the Games, but surviving in Scary School as well. I think many kids will be able to enjoy this book and it’s perfect for Halloween which is only a few months away! I definitely can’t wait to see what the next book has in store for Scary School! P.S. Huge thank you “Derek the Ghost” for sending me this to read and review!